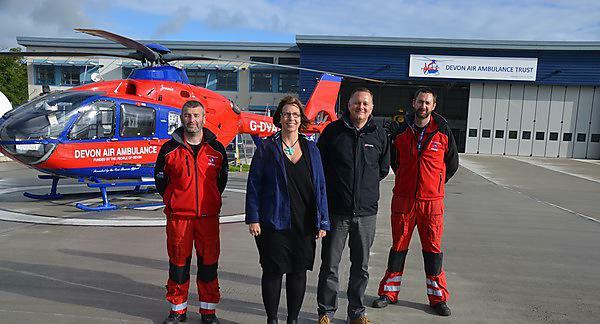 Plymouth University and the Devon Air Ambulance Trust (DAAT) have welcomed the first students to a new programme thought to be the first of its kind in the world. The institution and the charity have collaboratively put together a masters (MSc) in pre-hospital critical care / transport and retrieval, which enables paramedics to train specifically for the demands of being an air ambulance paramedic. The idea was the brainchild of DAAT, who approached Plymouth University academics in January last year, and have worked alongside the experts to build the programme – the University’s first postgraduate paramedic qualification. Over a three-year period studying for ten hours a week, 20 paramedics will gain this new qualification and will be encouraged to contribute to advancing the body of knowledge underpinning pre-hospital critical care through continued research and further study. “The idea for this degree was only formulated in January last year and it is a testament to the commitment of everyone involved in the collaboration that the programme is up and running within a year. We have created a platform for personal, academic and practical advancement in this highly specialised area and it has already caught the attention of the wider profession, with paramedics from several other air ambulance services joining the programme. “The world of pre-hospital emergency medicine is moving very quickly with numerous clinical papers published each month, suggesting new and innovative procedures and practices. The aim of this programme is to equip already highly experienced paramedics with the knowledge to appraise, and where necessary challenge, current thinking and bring their own experience to bear in advancing clinical practice. This pathway is a crucial qualification for pre-hospital care providers working or considering future employment within a Helicopter Emergency Medical Service (HEMS) or Air Ambulance Service. Our syllabus has been developed to meet the needs of air ambulance paramedics, land based paramedics and other relevant health care professionals. Welcome to the School of Health Professions where we pride ourselves in the quality and professionalism of our academic offer and where our courses are designed to meet the demands of contemporary health and social care practice. As you begin your professional journey we will encourage you to reach your full potential and achieve excellence in your chosen discipline. We also want you to enjoy your time with us and hope that you will embrace some of the social and recreational opportunities that are such an important aspect of university life. As a health professions student it is important to note that you not only represent Plymouth University but also the profession you are about to enter. This brings new responsibilities and you will be expected to behave in a suitably considerate and professional manner at all times. The standards you set yourself and your personal values are just as important as your academic achievements.